Doing something good for the environment in Indianapolis can now earn you currency that can be exchanged for goods at local businesses. The program—called Make Change—allows people to do something as simple as riding their bicycle or as involved as participating in a neighborhood cleanup program in exchange for redeemable coins. Each hour of activity is worth $10 in aluminum coins specially created for this program. A list of activities is below. Coins can be redeemed at locations including The Children’s Museum of Indianapolis, the Good Earth, and Broad Ripple Brew Pub. A complete list is below. For more information about the program, visit makechangeindy.com. Make Change was originally funded through a grant from the Environmental Protection Agency’s (EPA) Urban Waters program and launched in January 2013 in the neighborhoods between Fall Creek and 38th Street. As of Friday, June 20, the program is being expanded to the entire Midtown area, thanks to a $1,000 Nice Grant from SmallBox, an Indianapolis-based web design and marketing company. Residents of Midtown or those who perform their activities in Midtown are eligible to participate. 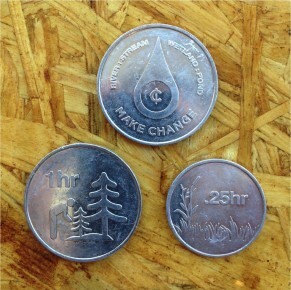 Participants can earn as much Make Change currency as they want. With some activities—like, say adding a rain barrel to a home—all the participant needs to do is document his/her activity through social media with the hashtag #MakeChangeIndy. In the case of community projects, organizers will be given coins to distribute to participants. The program will continue at least through the end of 2014, Carter said. -Replace an incandescent light bulb in your home. -Document your trip on one of the bike trails in Indianapolis. -Donate to Indy Upcycle, 6358 North Guilford Avenue, which sells art and craft materials at pay-as-you-wish pricing. -Participate in the bike share. -Have an energy audit done on your home. -Plant a garden/native plants (one hour for every 10 square feet).